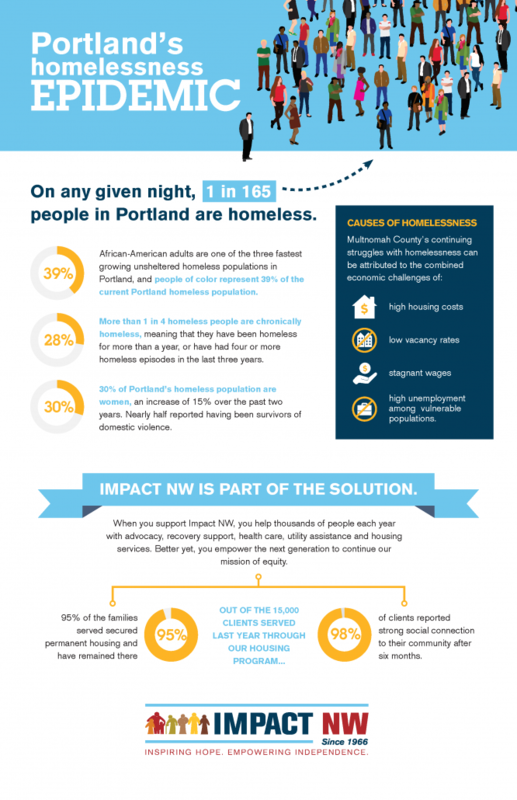 On any given night, 1 in 165 people in Portland is homeless. African-American adults are one of the three fastest growing homeless populations in Portland, and people of color represent 39% of the current Portland homeless population. More than 1 in 4 homeless people are chronically homeless, meaning that they have been homeless for more than a year, or have had four or more homeless episodes in the last three years. 30% of Portland’s homeless population are women, an increase of 15% over the past two years. Nearly half reported experiencing domestic violence. Our region’s continuing struggles with homelessness can be attributed to the combined economic challenges of high housing costs, low vacancy rates, stagnant wages, and high unemployment among vulnerable populations. Impact NW is creating a solution. Impact NW provides a safety net for families in crisis, with services that connect them to housing and energy assistance while supporting them as they move toward independence. When you support Impact NW, you help thousands of people each year with the services they need to recover and build stability and plans for the future. Out of the 15,000 clients served last year through our housing program, 95% who found permanent housing have remained there, and 98% reported strong social connection to their community after six months.